The L-2455 Diode Array Detector is designed as a single-beam photometric detector with a grating monochromator. It is equipped with a 1024-bit diode array element to suply the highest spectral resolution over the complete wavelength range. 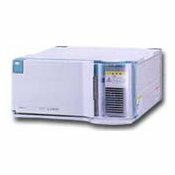 When used in combination with the EZChrom Elite chromatography data system, the L-2455 Diode Array Detector records and processes 3-dimensional chromatographic data. 3D chormatogram data can be background-subtracted and displayed as contour plot, as 3D chromatograms, as extracted 2D chromatograms, and as extracted spectra. You can also select combinations of these display modes. Automatic peak identification by comparison of analyte spectra with library spectra. Peak purity assessment by comparison of spectra taken at different positions of the peak. Comparison of spectra and calculation of similarity indices. "Hit List" of best fitting spectra with similarity indices. Max Plot: Chromatogram at absorbance maximum for each analyte. Wavelength bunching: Chromatogram calculated over a specified wavelength range for optimizing sensitivity. Ratio Plot: Ratio chromatogram calculated from chromatograms at two different wavelengths for assessing peak purity.